Be dainty or daring in your choice of a print dress from this collection of trendy print formal gowns and party dresses. 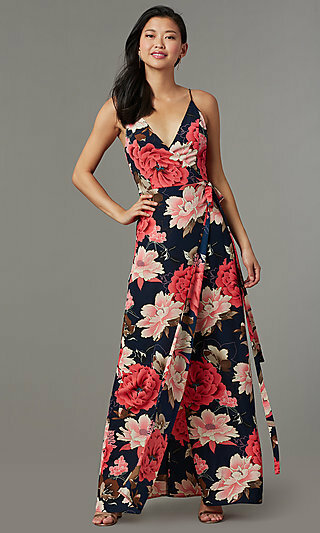 From pretty floral-print cocktail dresses to tropical-print long evening dresses, you will find an array of long and short print dresses to indulge your feminine side. If you are looking to make a bold entrance, choose a stunning backless print evening gown or a dynamic print v-neck party dress. Casual print dresses and formal print gowns are the perfect way to add something unique to your look for your next event, and this collection will have the ideal print dress for you. Where Can I Find a Variety of Print Dresses? 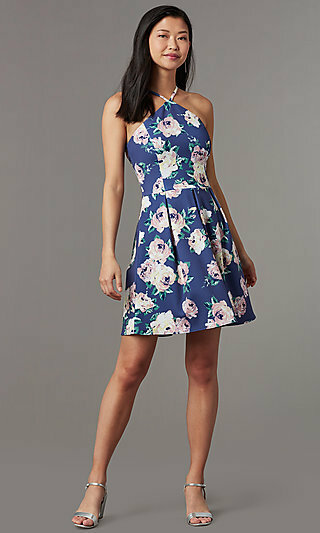 Dress to impress in one of these print dresses at your next special occasion. This collection features a variety of short print dresses and long print formal gowns in several different lengths and designs to fit your personal style. Choose from short print cocktail dresses, high-low print party dresses or floor-length print evening gowns to fit your occasion. The hottest trends combine to create short two-toned floral-print dresses with pockets and high-neck long beaded formal gowns with geometric prints. For a more casual look, try an off-the-shoulder print shift dress or a spaghetti-strap maxi dress with a floral print. Whether you are looking for a print formal evening gown or a casual print dress, this collection has a print dress ideal for showcasing your individual style at any event. Shop this collection of print dresses for you next special occasion, or just to find chic styles for your everyday wardrobe. Summer vacation is the perfect time to stock up on flirty floral-print sundresses and pretty tropical-print long dresses for your next cruise or beach resort trip. A charming fit-and-flare lace party dress with a bright print will make you the best-dressed guest at a summer wedding. Concerts and festivals are the perfect place to wear a comfortable, but contemporary, cold-shoulder casual print dress. Looking for an eye-catching fashion? Try a short cocktail dress with an animal print or bold floral appliques, or channel a retro vibe in a polka-dot print dress. Fill your closet with some new casual print dresses for everyday fashion, print cocktail dresses for semi-formal festivities, and print evening gowns for formal celebrations. There is no end to the possibilities and occasions covered by this collection of print dresses.